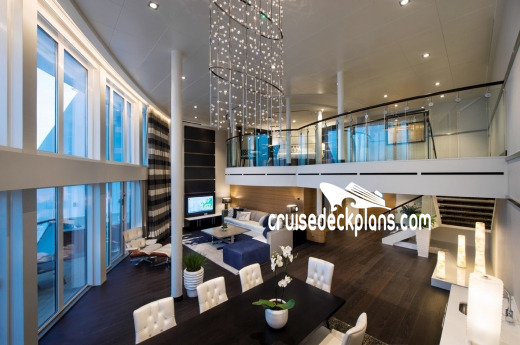 Main level balcony 415 sq.feet, main level side balcony 109 sq.feet, upper level side balcony 89 sq.feet. 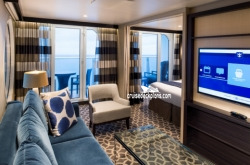 This is known as the Star Class and perks may not be available on some sailings from Asia. 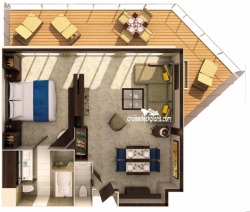 Main level balcony 303 sq.feet, main level side balcony 109 sq.feet, upper level side balcony 89 sq.feet. 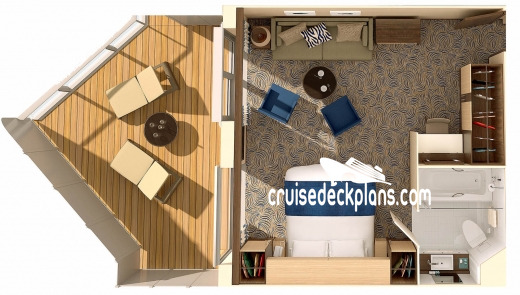 Balcony for category GB (was SG) is 259 square feet and for category GS 109 square feet. 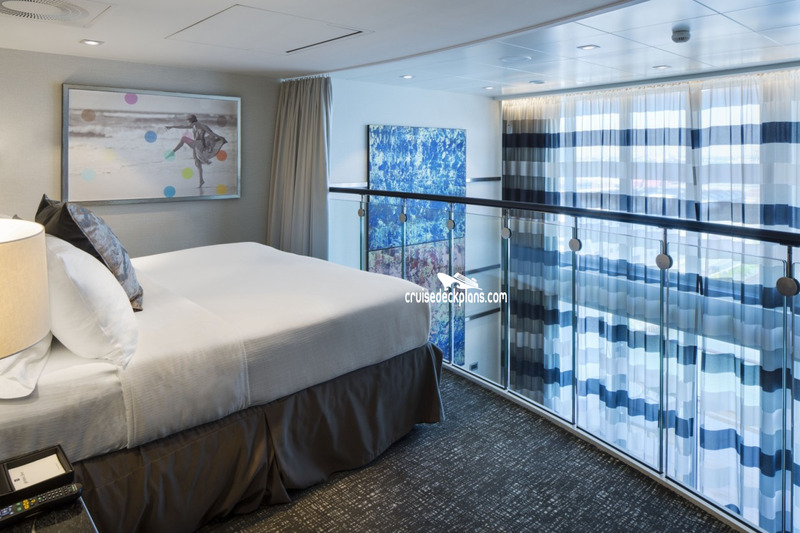 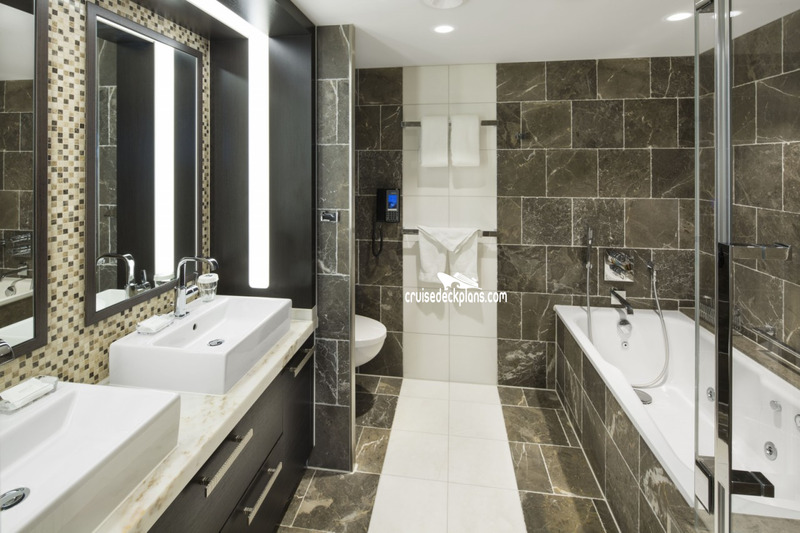 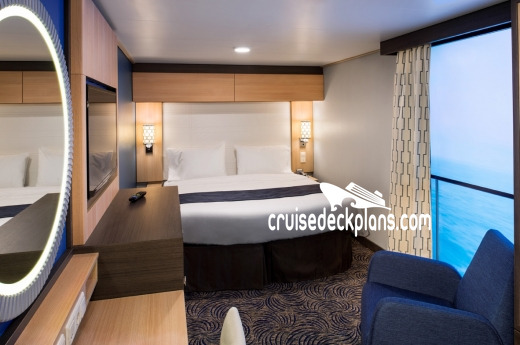 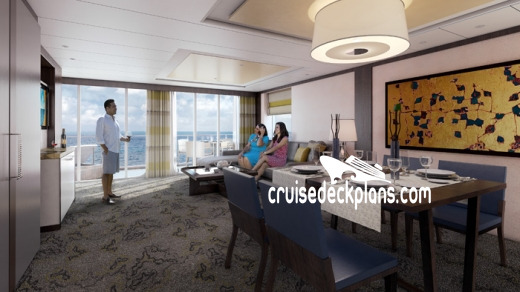 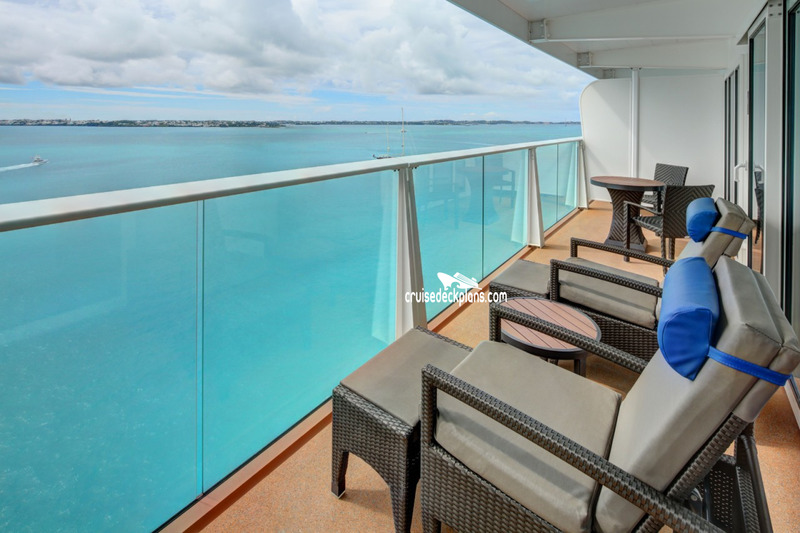 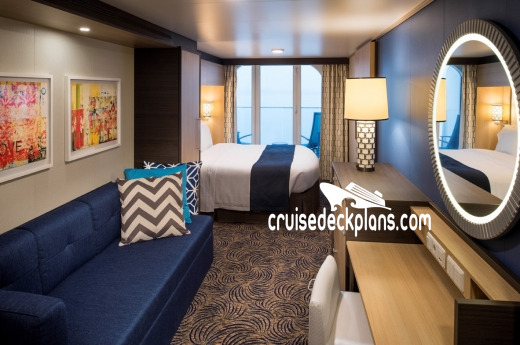 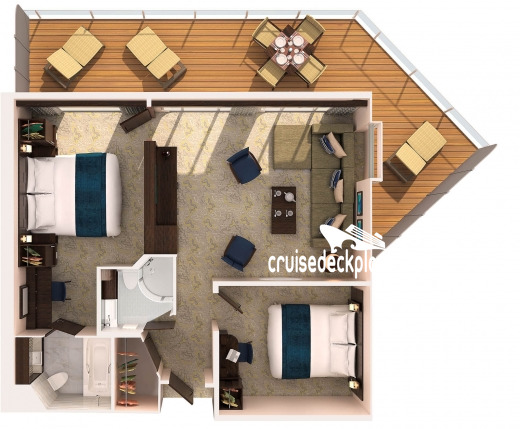 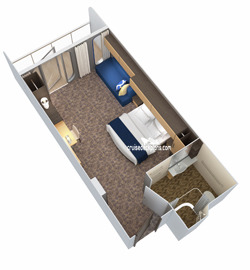 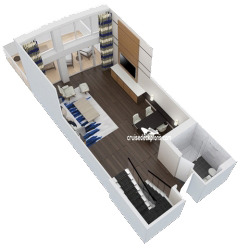 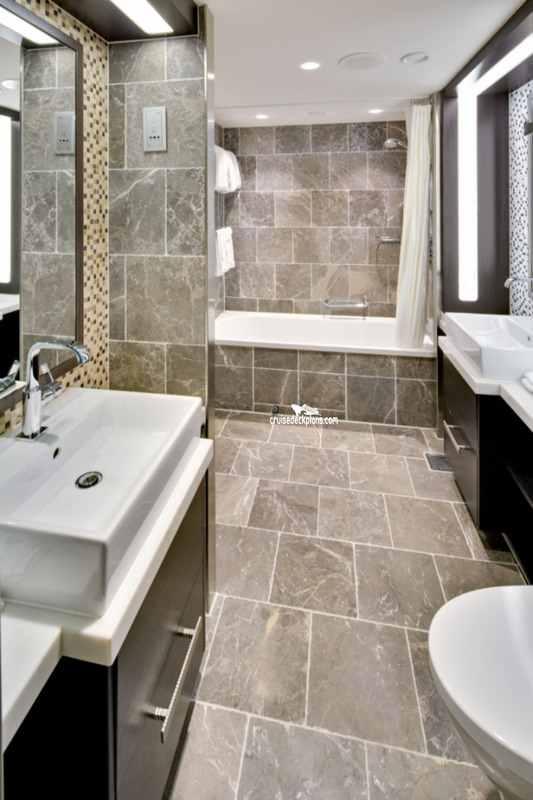 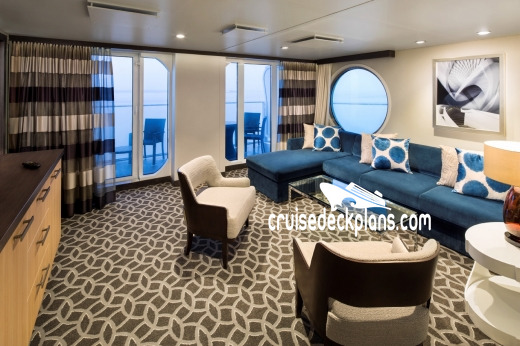 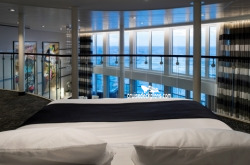 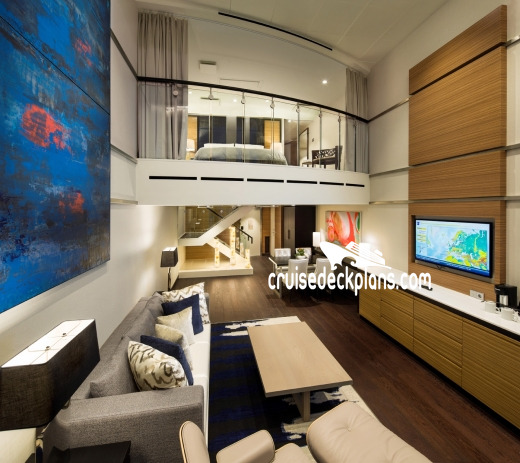 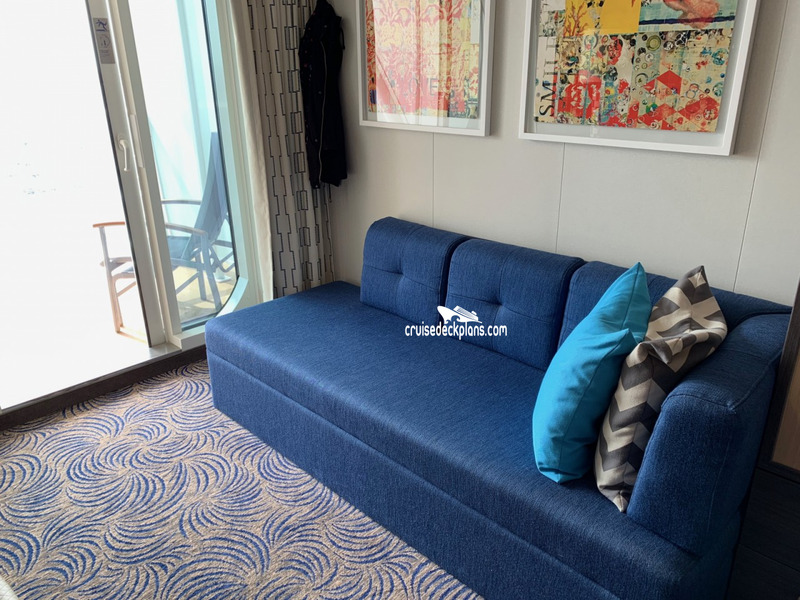 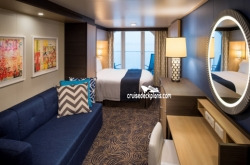 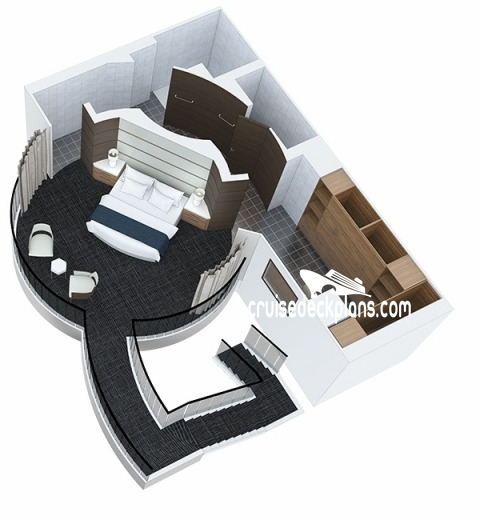 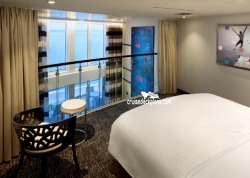 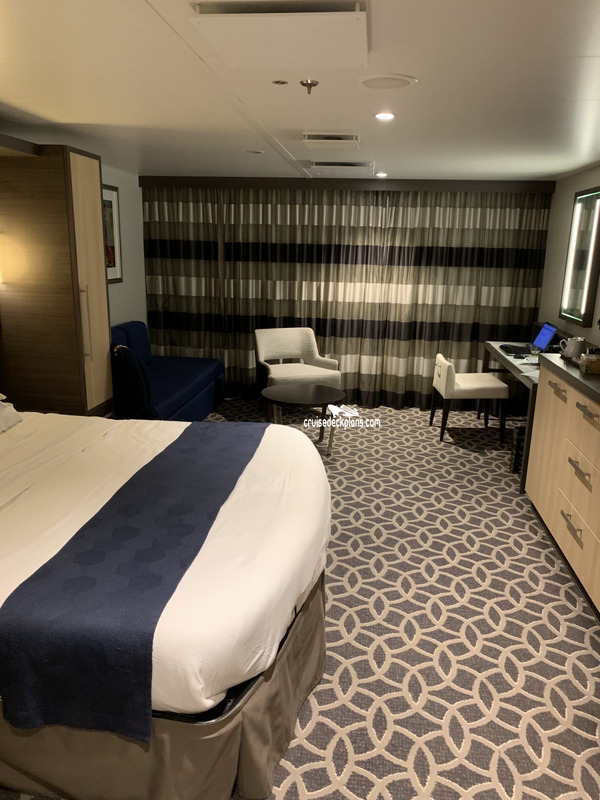 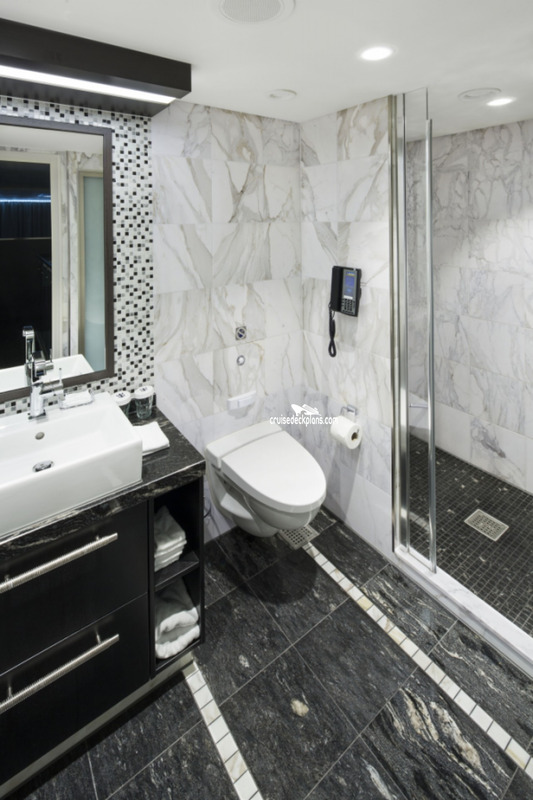 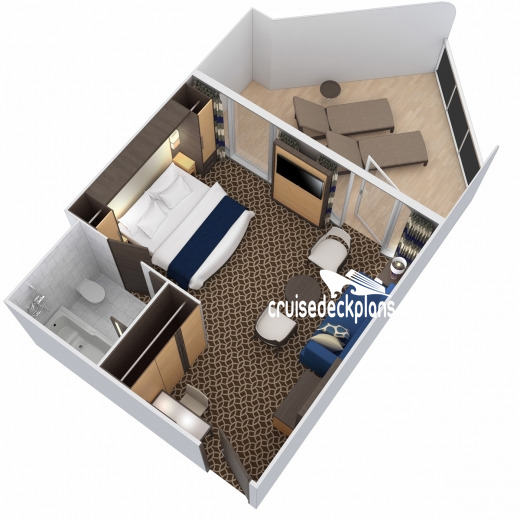 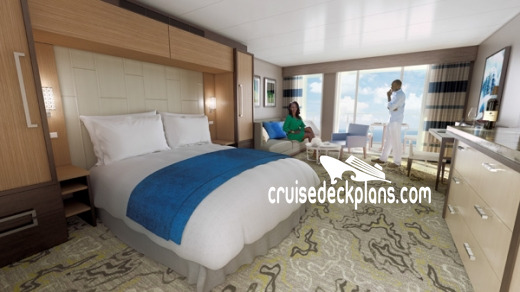 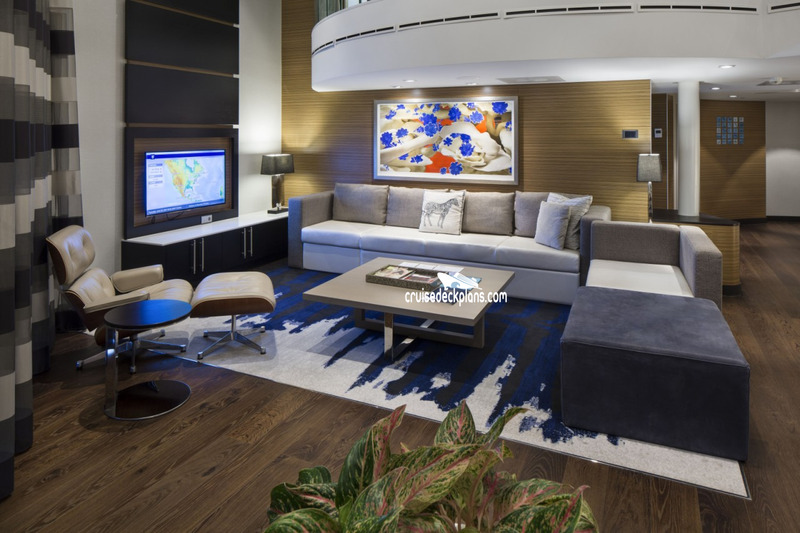 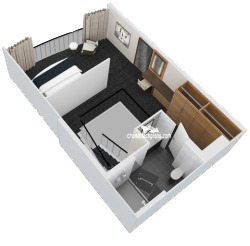 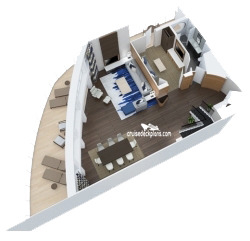 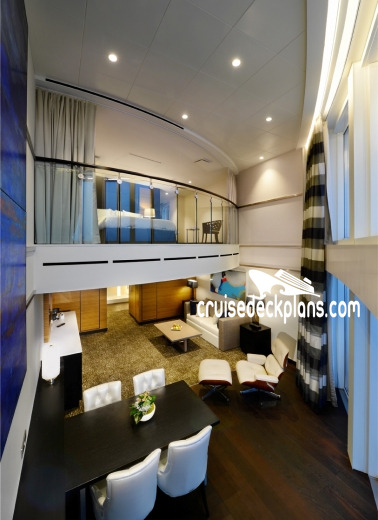 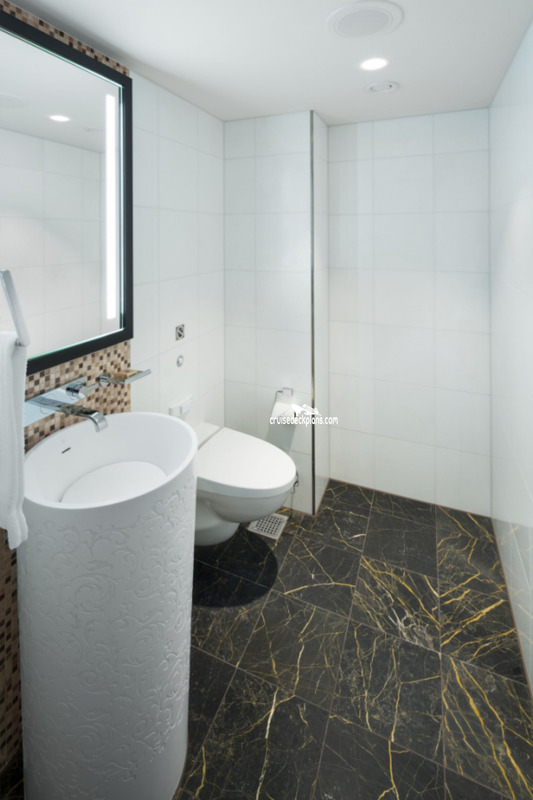 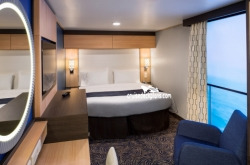 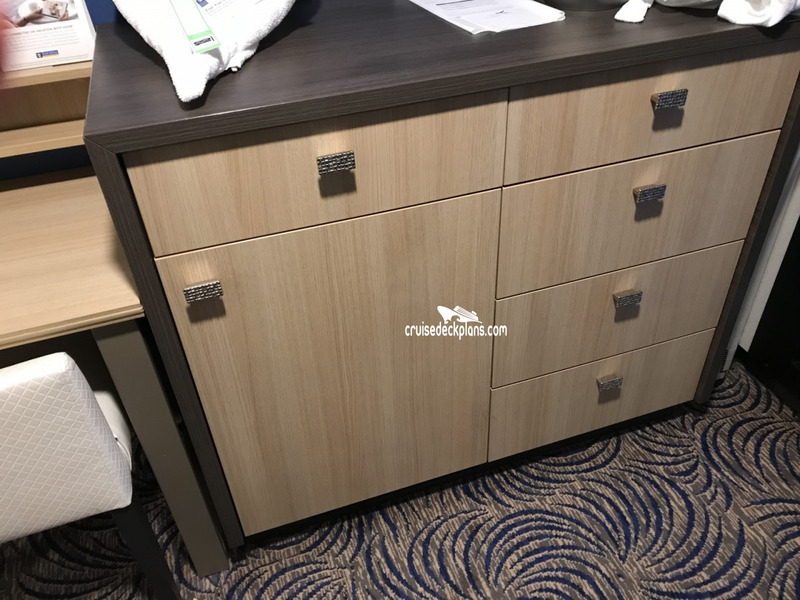 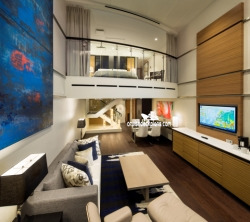 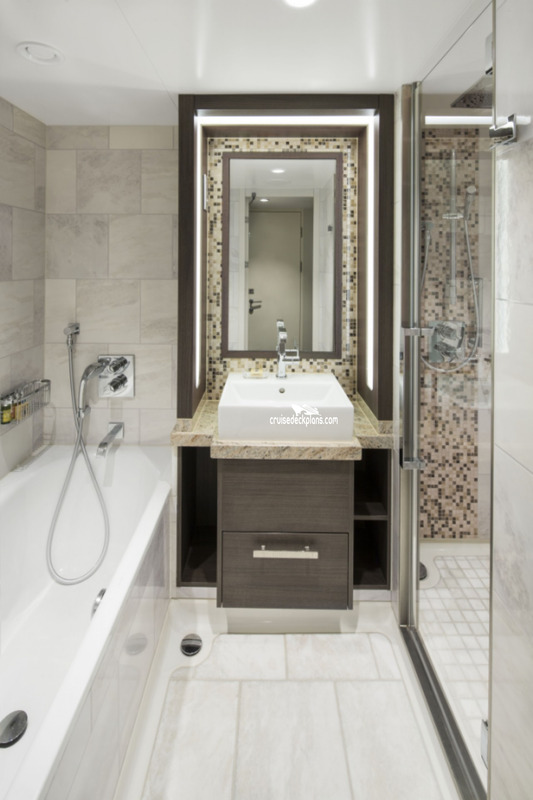 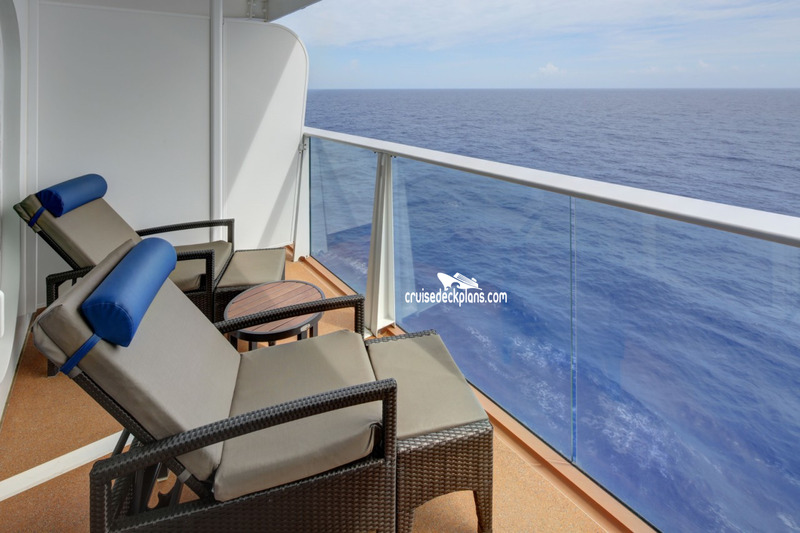 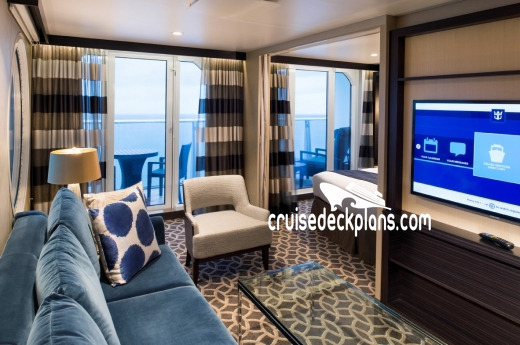 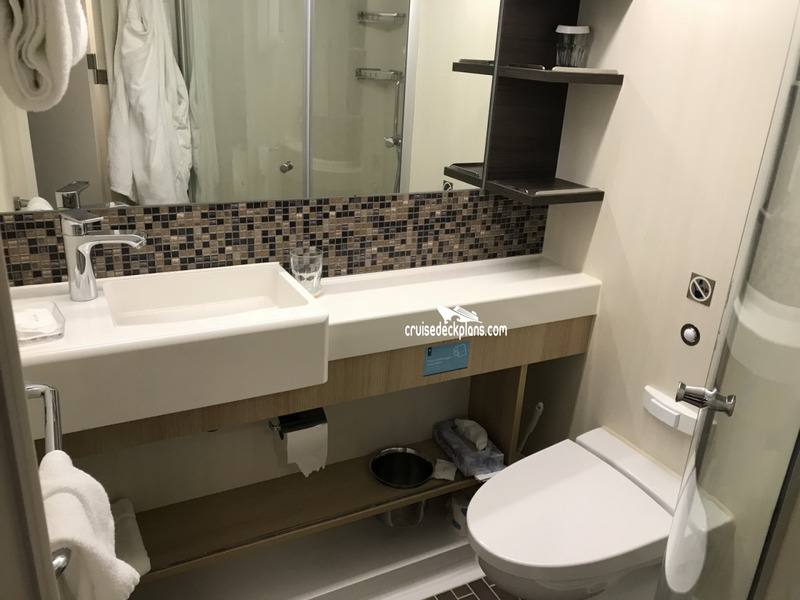 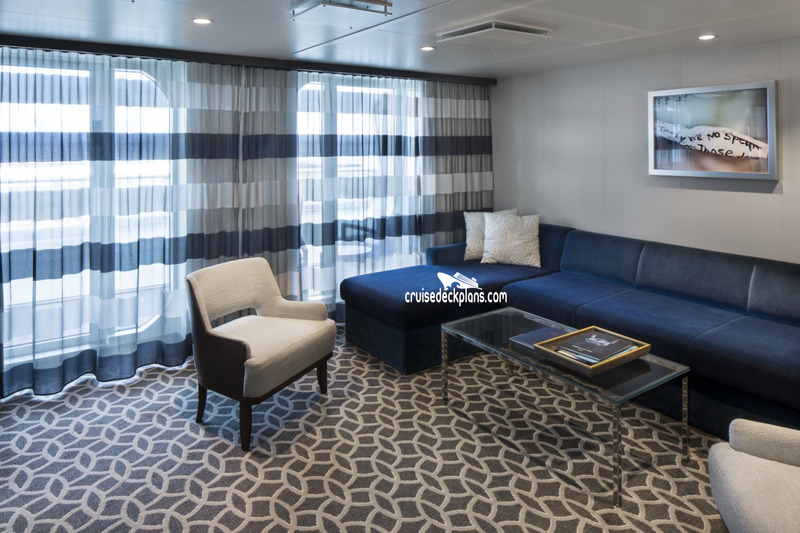 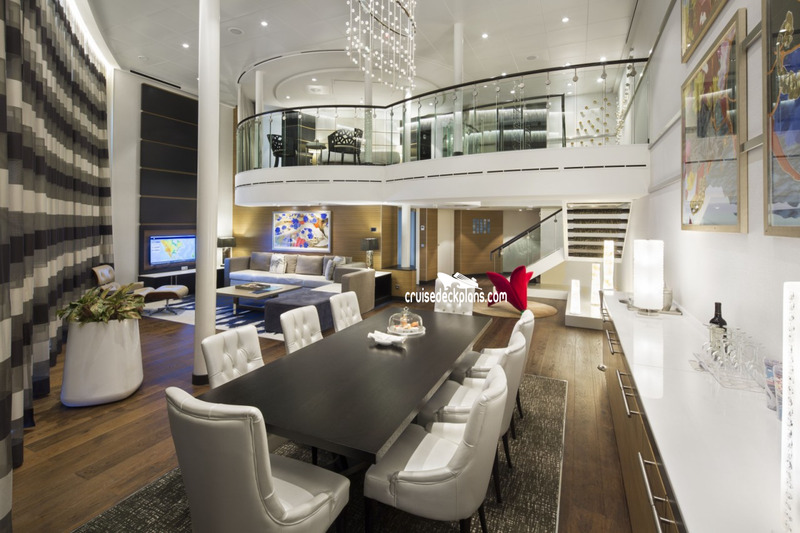 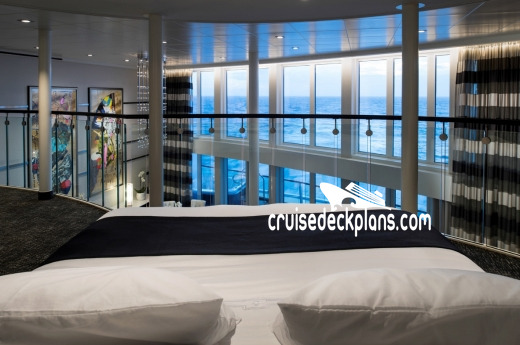 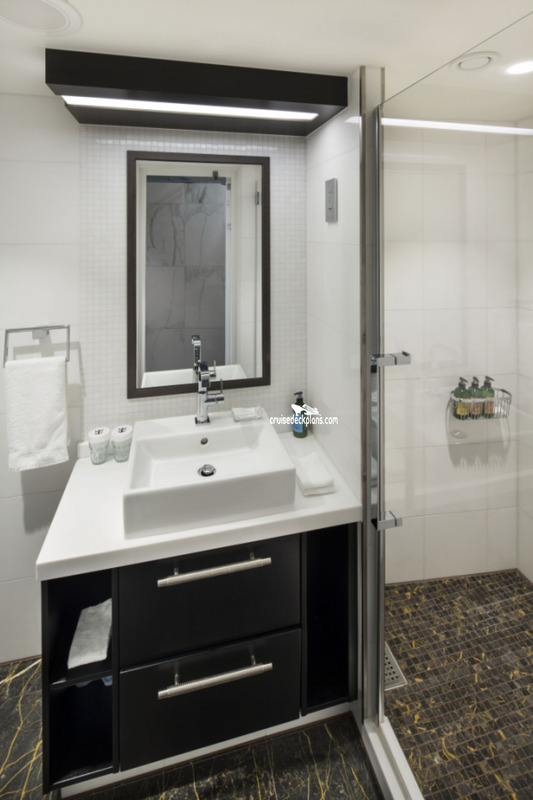 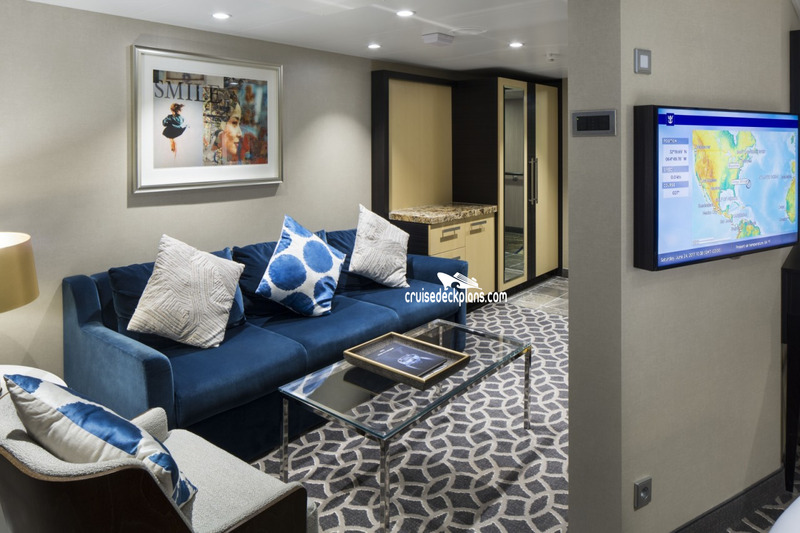 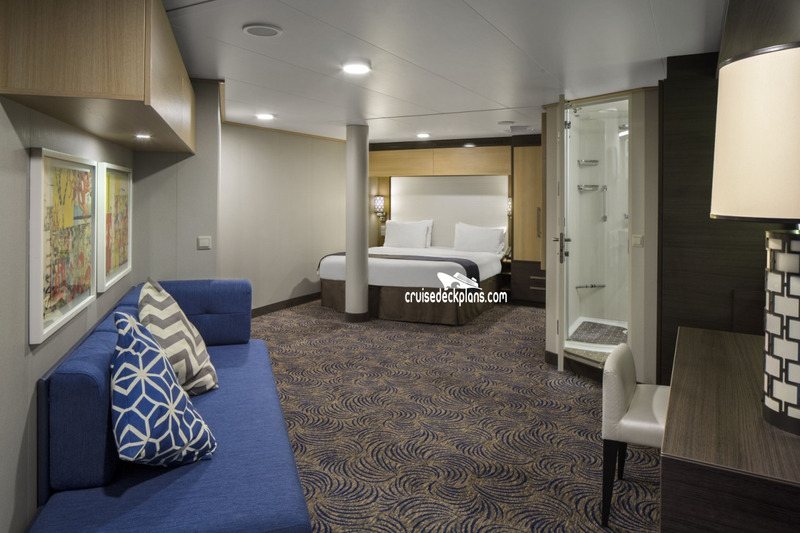 This suite can be combined with nearby balcony and interior cabins to create one large family connected stateroom with 3 bedrooms, 3 bathrooms and a balcony for all your family needs. 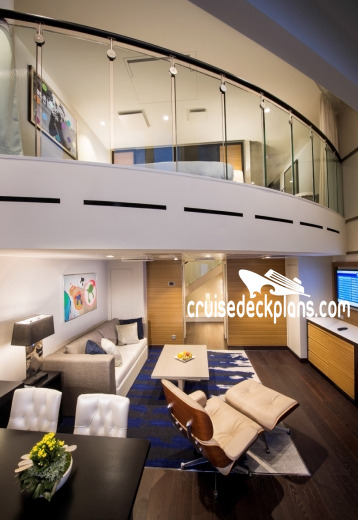 Sleeps 8 to 10 guests. 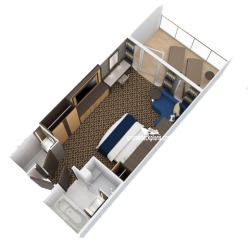 Total square footage is 575 sq ft plus 216 sq foot balcony. 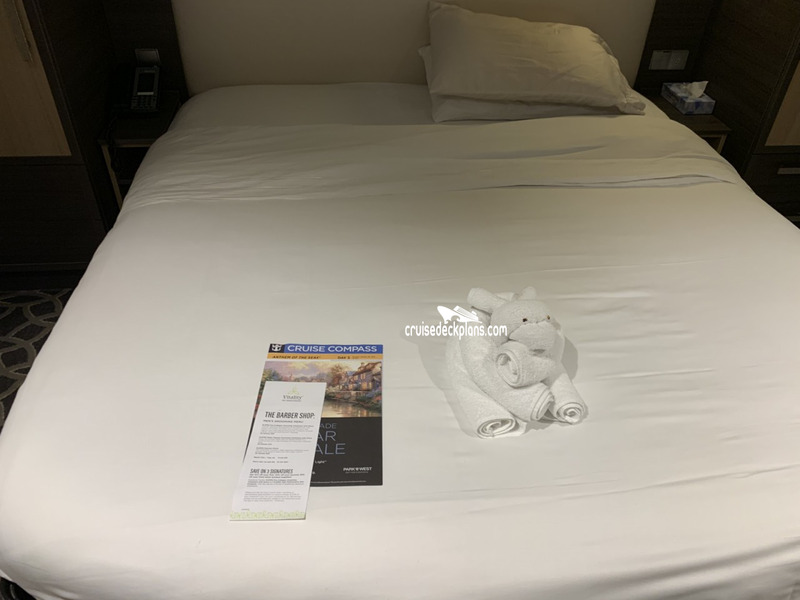 You can not book this category online. 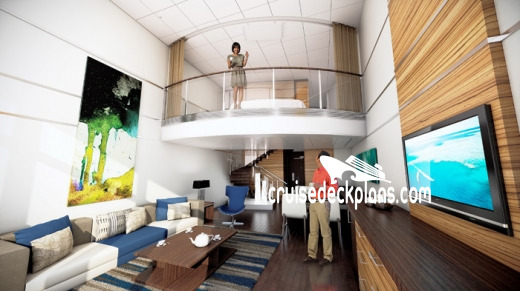 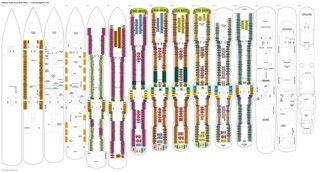 2C (was D1) balconies range from 55 to 119 square feet. Cabins 6254, 6258, 6654, 6658, 7254, 7258, 7654, 7658 have a chair instead of sofa and are 177 square feet with 82 square feet balconies. 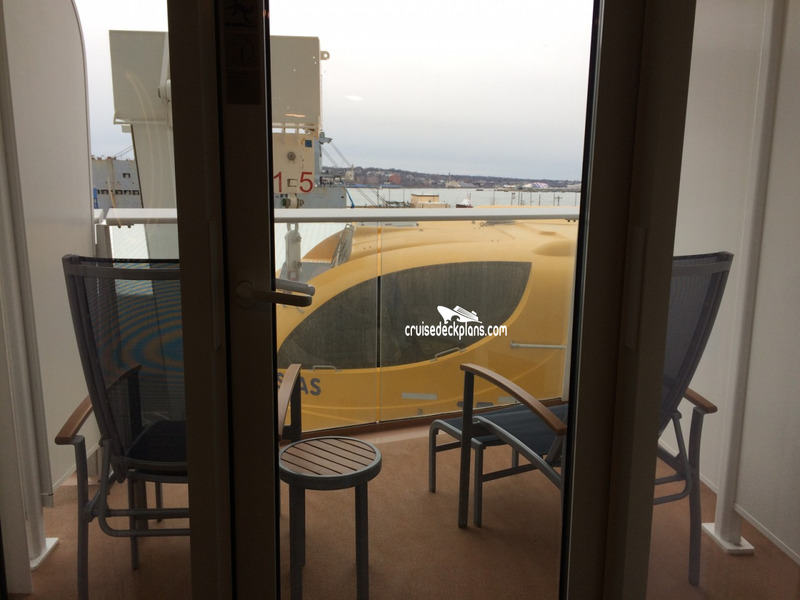 Category 1E and 2E (was DO) and 2F (was SB) is obstructed by view of top of lifeboat. 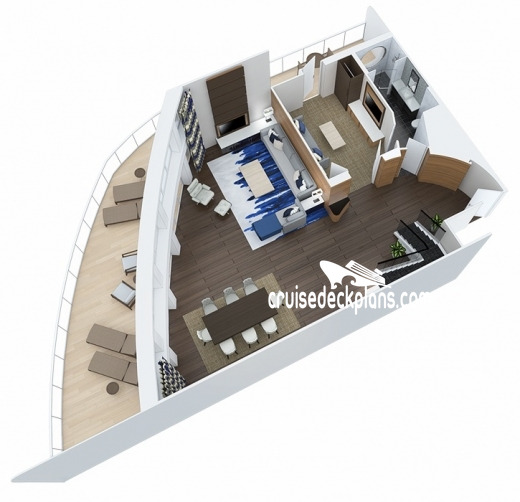 Forward category 2E (was DO) on deck 7 and deck 8 is obstructed by steel frame that forms porthole opening. Some cabins have sofa near the balcony and others have bed near the balcony. 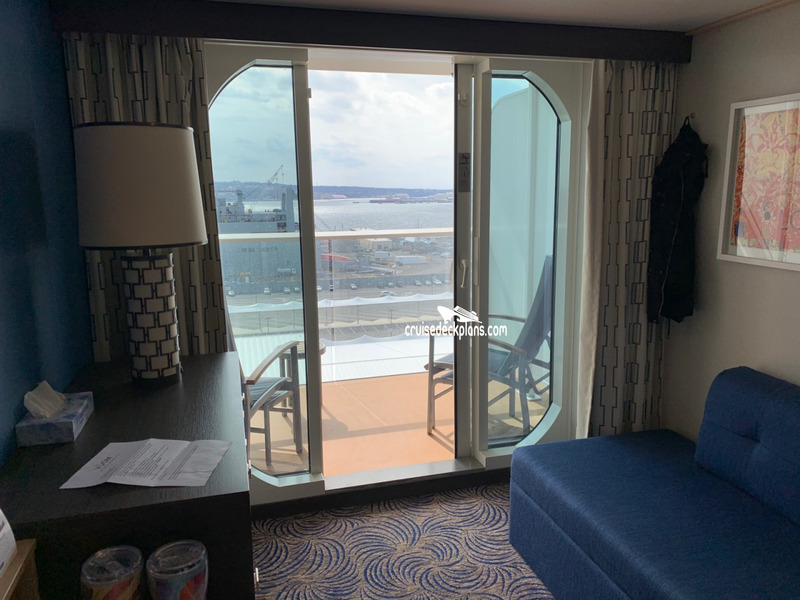 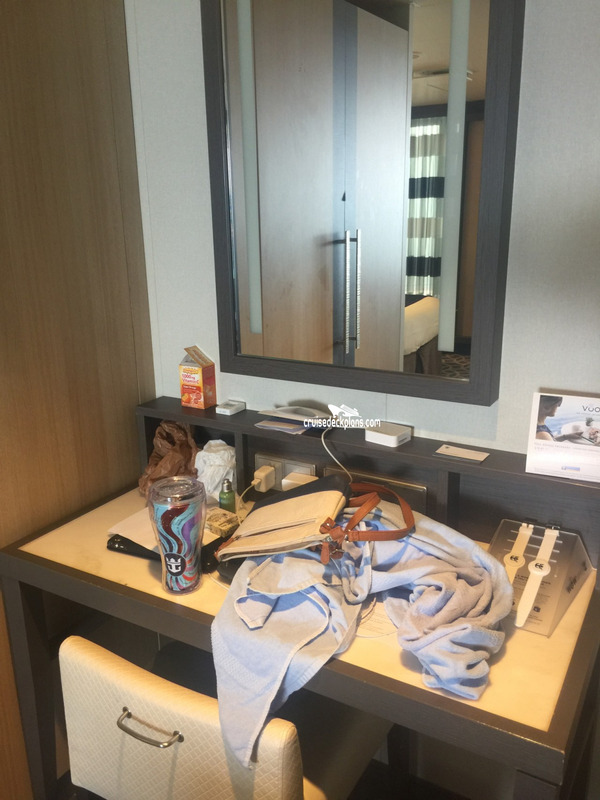 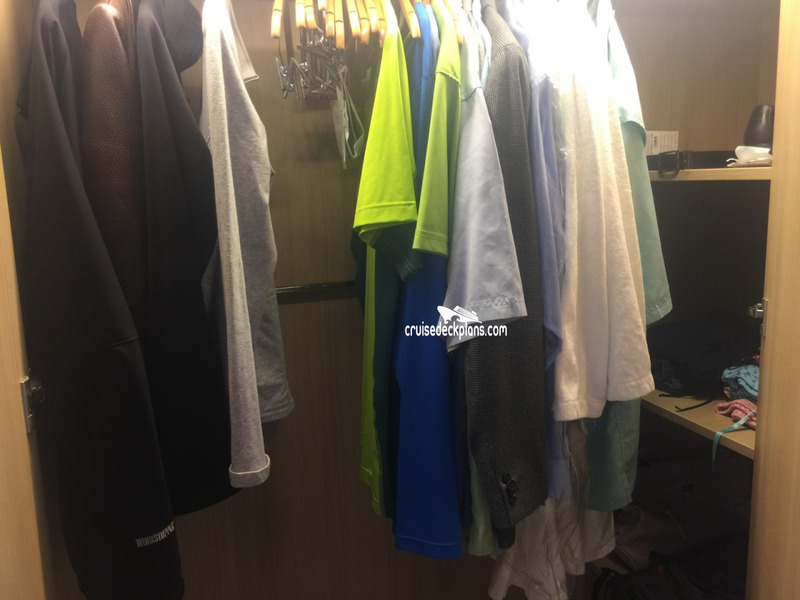 Staterooms 6254 6258 6654 and 6658 have obstructed views. 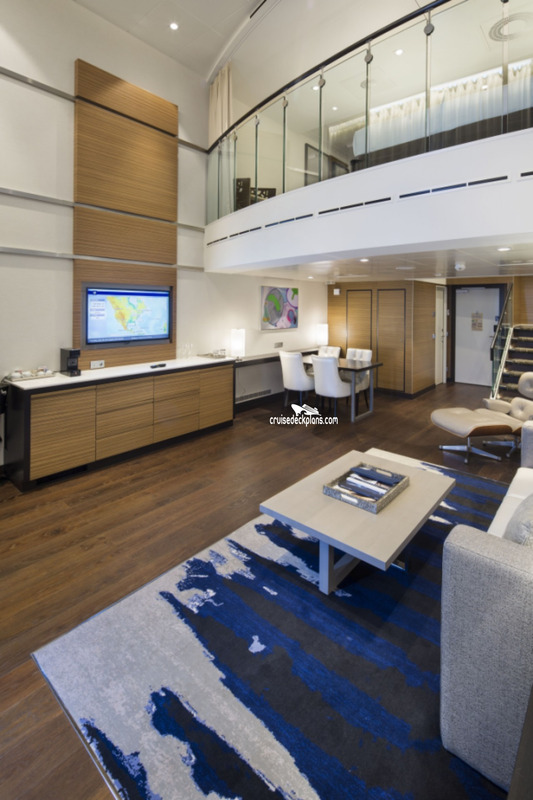 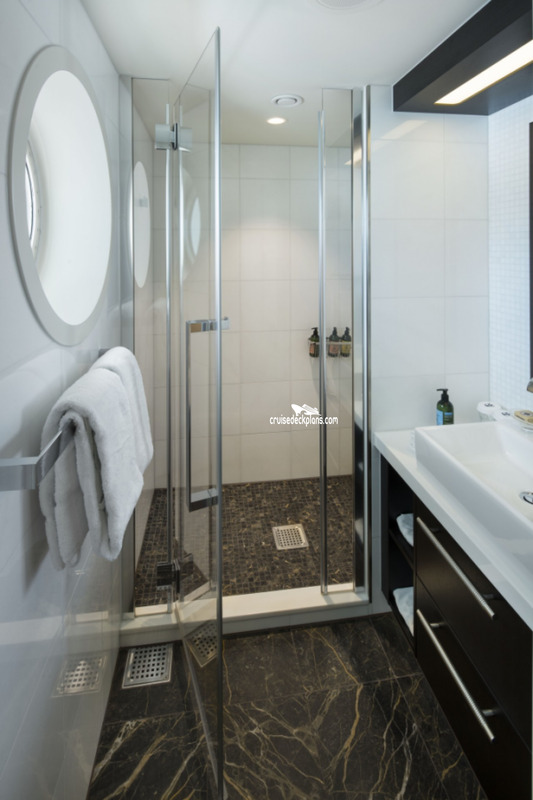 Forward Oceanview cabins on decks 8, 9, 10 and 11 are 214 square feet. 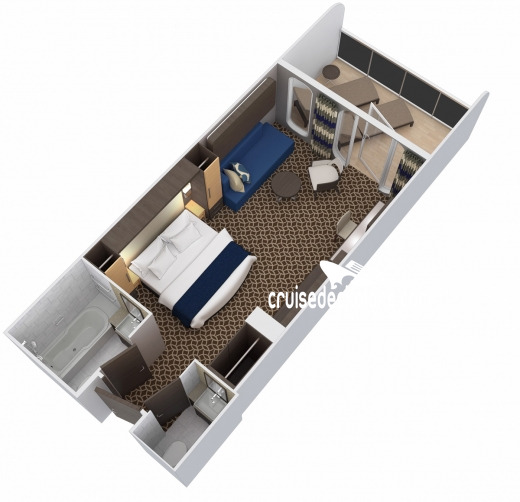 Category 1M forward corner cabins have Alcove with large forward-view panoramic window with seat and lounge chair and are 302 square feet. 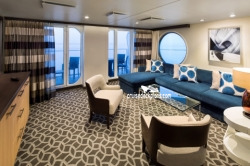 - NOTE: Inside cabins that have the door opening on long side of cabin do not have sofa. 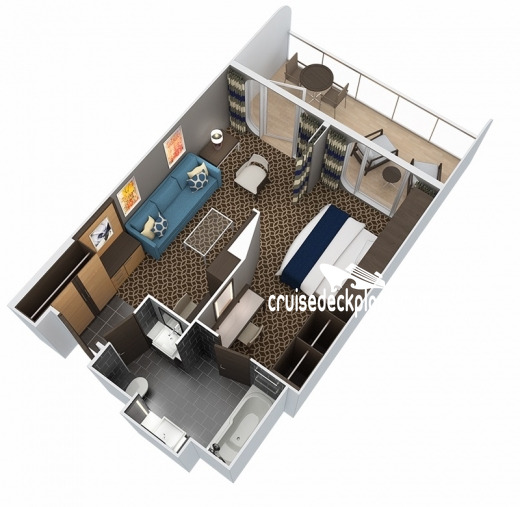 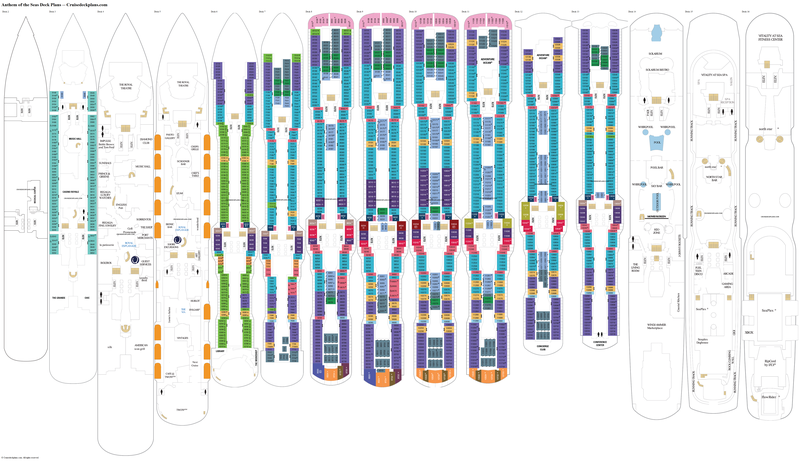 - Category M and N inside cabins have chair instead of sofa. 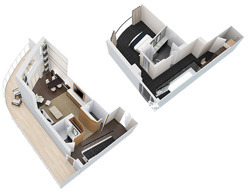 Category 1U (was V1) and 2U (was V2) cabin size range from 178 to 187 square feet. 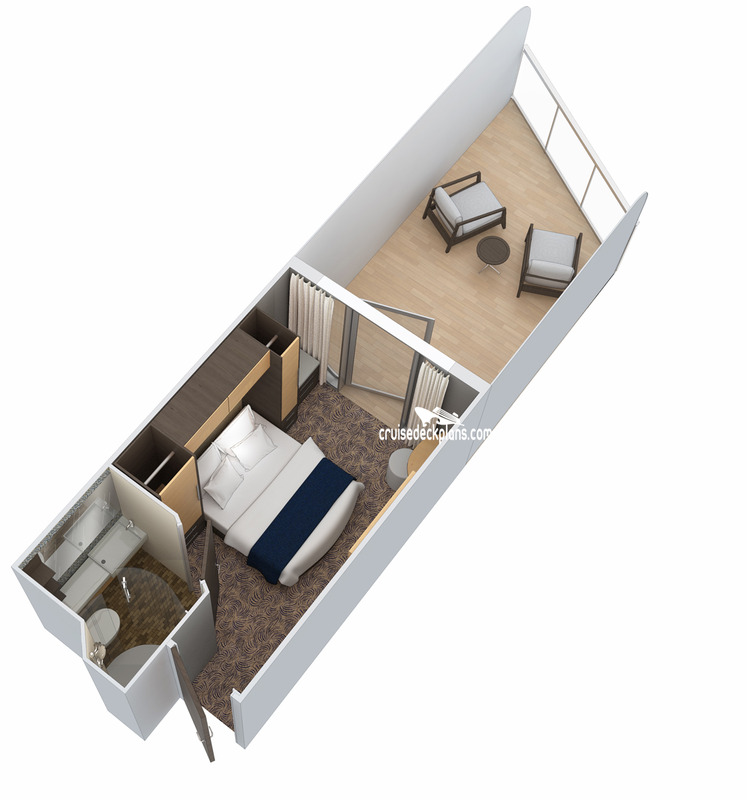 Cabin 2W (was SI) is single occupancy, no single supplement required and is 101 square feet. 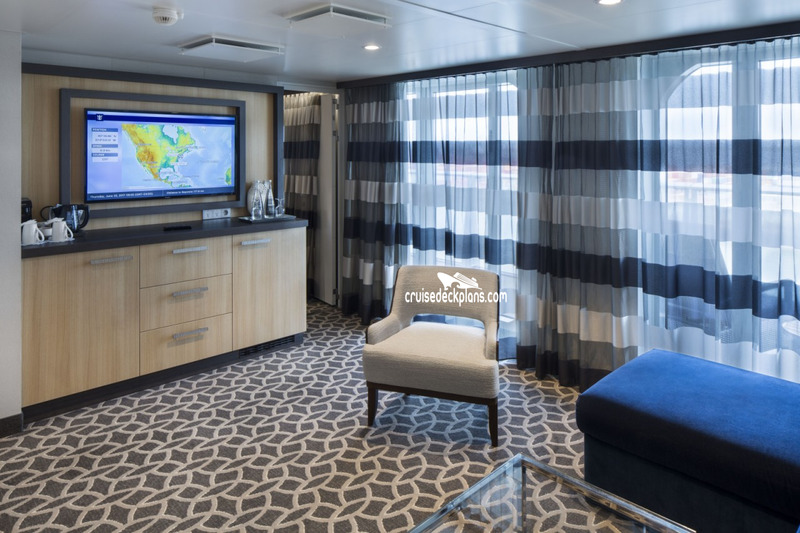 Note: Real time scenery in category 2W (was SI) is delivered via the flat-screen tv.